Goelst has had its own R&D department for 18 years and now possesses various patents and design protections. Goelst will certainly maintain its leading position in the market in the coming years with its clever solutions and innovations. Goelst started in 1978 as a sole proprietorship in interior products, started by Rolf E. Goelst. Already after a year the company expanded the range with a curtain rail program under the name G-Rail. The 9 years of experience that Rolf Goelst had already gained in the curtain rail profession, he could put to good use for his own company. In the years that followed, Goelst grew into a respected company, expanding the range of curtain rails and the products became more advanced. In the healthcare sector, Goelst became the standard supplier for separation rail, a role that the company still fulfills to this day. Corporate social responsibility is a high priority at Goelst. We produce mainly in the Netherlands and in other European countries, meeting the most stringent environmental standards. This means that we also monitor our CO2 footprint. Naturally, we strive for the lowest possible CO2 emissions. 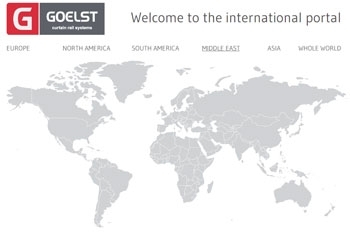 Goelst monitors the quality of all its products continuously. We have chosen not to produce in low-wage countries because of the combination of our high quality requirements and corporate social responsibility. Under the motto 'top quality at an acceptable price', Goelst began to look beyond his own national borders in the mid-1980s. This internationalization made it necessary to baptize the sole proprietorship into a private limited company and since then Goelst has been located in Ede, the geographically - and easily accessible - center of the Netherlands. An in-house product development department has given Goelst the opportunity to put great emphasis on innovation. For example, in 2001 Goelst was the very first curtain rail manufacturer to market a quiet, electrically operated systems. The company now has a whole series of innovative products in its range that are frequently copied by competitors but never equaled. In May 2013, Goelst became a sister company of STAS picture hanging systems. Since then, Goelst has been given a new life under the name Goelst NL. Goelst NL is not affiliated with Rolf E. Goelst and Frank Goelst. The employees in Ede, with their years of experience and expertise, are of course always at your service, ready for your questions. An ongoing dialogue with project designers, architects and interior designers keeps the company informed and alert. Your critical input to improve our range, the quality, the range, the pricing and the delivery method is therefore very welcome. • The 2102 rail captured the market in 1999 with its beautiful design and supports with valve cover. • In 2001, Goelst introduced a revolutionary electric curtain rail system to the market. After developments in that field had been quiet for years, Goelst came up with a plug-in low voltage system, super silent, with electronic end positions and standard remote control. Now copied by many manufacturers..
• The 2900 series narrow-gauge multi-track hotel rail is also an invention by Goelst.